Srila Prabhupada: How is the body growing? On account of the presence of that small particle, the soul. Take, for example, this boy. This boy has got a small stature of body. Now, this boy will grow a very stout and strong body in his young manhood, say by the age of twenty-four years. Then that young-man body will go; another body will come. How is it all becoming possible? On account of the presence of the small particle, the soul. But if that particle of soul is taken away or if it goes away, this body will no longer grow or change. That function of the soul is Krishna consciousness, working in Krishna consciousness. So in the present age, one has to take directly to the function of the soul. Then other understandings will automatically come. It is not possible at present that you can go to a secluded place and peacefully sit there and meditate. It is not possible in this age. It is impossible. If you try artificially, it will be a failure. Therefore, you have to take to this process: harer nama harer nama harer namaiva kevalam/ kalau nasty eva nasty eva nasty eva gatir anyatha—“In this age of Kali, there is no alternative for self-realization but this chanting of Hare Krishna, chanting of the Lord’s holy name.” That is the practical, real fact. Disciple: Srila Prabhupada, is there any way for a Christian in this age—without the help of a spiritual master—to reach the spiritual sky through reading the words of Jesus Christ in the Bible and trying to follow his teachings? 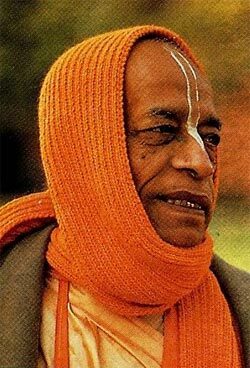 Srila Prabhupada: When you read the Bible, you are following the spiritual master. How can you say “without a spiritual master”? As soon as you read the Bible, that means you are following the instruction of Lord Jesus Christ. That means you are following the spiritual master. So where is the opportunity of being without the spiritual master? Disciple: I was referring to a living spiritual master. Srila Prabhupada: There is no question of whether the spiritual master is “living.” The spiritual master is eternal. Now, your question was what to do “without the spiritual master.” Without the spiritual master you cannot be, at any stage of your life. You may accept this spiritual master or that spiritual master. That is a different thing. But you have to accept. When you say “reading the Bible,” that means you are following the spiritual master, represented by some priest or some clergyman in the line of Lord Jesus Christ. So in any case, you have to follow the spiritual master. There cannot be the question of “without the spiritual master.” Is that clear? Disciple: I mean, for instance, we couldn’t understand the teachings of Bhagavad- gita without your help, Srila Prabhupada, without your presentation. Srila Prabhupada: Similarly, you have to understand the Bible with the help of Christ and the priest in the church. Disciple: Yes, but is the priest receiving a good interpretation from his disciplic succession or his bishop? Because there seems to be some kind of discrepancy in the interpretation of the Bible. There are many different sects of Christianity that interpret the Bible in different ways. Srila Prabhupada: Of course, there cannot be any interpretation of the Bible. Then the Bible itself has no authority. It is just like the old saying. “Call a spade a spade.” Now, if someone calls it something else, that is another thing. He’s not a spiritual master. For instance, this is a watch. Everybody has called it a watch. But if I called it a spectacle, then what is the value of my being a so-called spiritual master? I’m misleading. [Laughter.] “It is a watch.” That I must say. So when someone makes some misrepresentation, he’s not a bona fide spiritual master. Reject such a spiritual master immediately. That intelligence you must have: Who is a pseudo spiritual master, and who is a real spiritual master? Otherwise, you’ll be cheated. And that is being done. Everyone is interpreting in his own way. The Bhagavad-gita—there are thousands of editions, and all of them have tried to interpret in their own way. All nonsense. They should all be thrown away. Simply you have to read Bhagavad-gita as it is. Then you’ll understand. There is no question of interpretation. Then the authority is gone. As soon as you interpret there is no authority. Take a law book. Do you mean to say that in court, if you say before the judge, “My dear lord, I interpret this passage in this way,” it will be accepted? After all, then what would be the authority of the law book if everyone came and said, “I interpret in this way”? When is interpretation required? When a thing is not understood. If I say “This is a watch” and everyone understands that “This is a watch, yes,” then where is the opportunity of interpreting that “This is a spectacle”? So unnecessary interpretation is not required, and that is not bona fide. And those who are interpreting unnecessarily—they should be rejected immediately. Immediately, without any consideration.